Day 1 & 2  North American departure. Day 3  Arrive in Kathmandu. We will meet you at the airport and take you to your hotel, the Yak and Yeti or another of Kathmandu's 5-star hotels. Briefing in the afternoon. 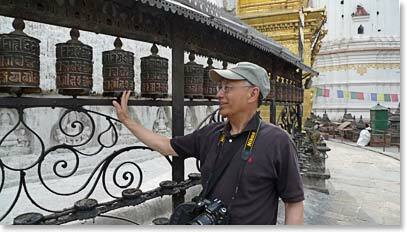 Day 4  Kathmandu: Our first day in this famous city will be spent touring major temples and sites. Your introduction will only skim the surface, but it will be a unique and fascinating beginning, and our schedule will be relaxed enough to allow for jet lag. Day 5  The flight to Lukla. This spectacular mountain landing strip is the gateway for expeditions, trekkers and Sherpa people to the Everest Region. You will be transported from Kathmandu to a bright and colourful scene in clear mountain air. It will feel good to stretch your legs, stiff from days of travel, as we walk downhill to the village of Phakding, along the Dudh Kosi River. Times have been good in the area recently and the trail is full of new Buddhist art, prayer flags and small monasteries. We sleep tonight with sounds of the roaring glacial water of the Dudh Kosi in the background. Day 6  Today we hike along the Dudh Kosi, entering Sagarmartha National Park just before lunch. In the afternoon, we climb the notorious "Namche Hill", our first real taste of "ukalo", the Nepalese word for "uphill." With some luck our first view of Everest will be on the way up the hill. Mid-afternoon we enter Namche Bazaar. Namche is small, scenic beyond belief, and surprisingly cosmopolitan. A mixture of Tibetan traders, tourists from around the world, expedition climbers, proud Sherpas, monks, Nepalese civil servants, dust, mud, colorful costumes and yaks. Day 7  Today is the first Namche day. Namche will be our home base for this trip. We will return here at the end of the climb. We stay indoors in a classic Sherpa style lodge, one that has been a center of many of our expeditions since 1987. Before breakfast we usually take a 10-minute walk to the National Park overlook just above our lodge. The views of Everest, Ama Dablam and Lhotse are exciting and promise much about the adventures ahead. Day 8  We trek out to Thame .This walk takes us away from the main corridor of travel towards Everest Base Camp. At the same time it takes us toward the home of many of the most accomplished Sherpa Everest Climbers. Tenzing Norgay is from Thame. We will stay in the family lodge of good Sherpa friends. Day 9  In the morning we hike to a ridge above town to visit the Thame Monastery. Perched high above the village is a classic Himalayan monastery. In the afternoon we walk to Khunde. 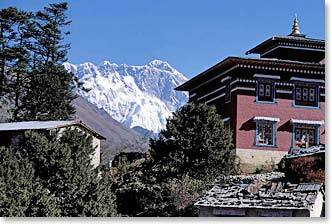 Day 10  Today we hike from Khunde to Tengboche where we will visit the famous Tengboche Monastery. 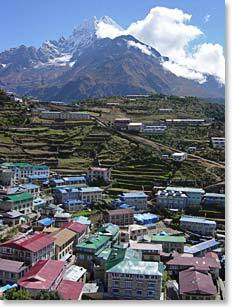 At Tengboche we will gaze up valley toward the plume blowing off Sargamartha - Everest. We then make our way to Pangboche and stay at the Highland Sherpa Resort, the lodge owned by BAI’s Ang Temba and his family. Day 11  A classic hiking day of the Khumbu. Ama Dablam still rises above us and we watch its shape change as we walk up the valley and see it from a different perspective. 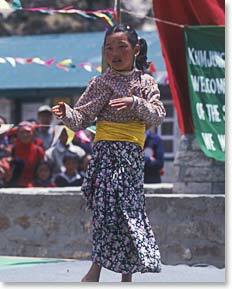 Our goal for the day is Pheriche14,000 ft/4266m home of the Himalayan Rescue Association clinic. Pheriche is in the shadow of Everest Base Camp. Yak trains returning from Base Camp make their first overnight stop here. Day 12  We awake to awesome mountain views in this cold valley. Towache Peak towers above the town. Kantega is sunlit and sparkles to the south. In the other direction we see Lobuche Peak and Cho Oyu, at the border of Tibet. We return from early morning photographs to our warm lodge. Today is an acclimatization day. We will sleep a second night in Pheriche. We might attend the Himalayan Rescue Association altitude lecture, or hike up over the ridge to the village of Dingboche. Day 13  Today we walk up onto the Khumbu Glacier! The lateral moraine of this famous glacier is visible as we walk out of Pheriche. Distances are short now, but each step is measured and deliberate as we move higher in the thin air. We take a break for tea and a trekking style lunch at Tukla. In the early afternoon we climb the moraine past the Chortens that have been constructed for Sherpas lost in expeditions over the years. Cholotse Peak and Lobuche Peak loom above. Our destination is the luxury of the Eco Lodge at Lobuche at 15,800ft/4816m. Day 14  Each day the distance we trek is shorter. But our walks are more measured and slow, in part due to thin air, in part due to the ice and ruble of the massive Khumbu Glacier and all the photographs we will be taking. We arrive at Gorak Shep, 16,800ft/5120m. This old yersa, or seasonal yak grazing area, has become the last outpost before Everest Base Camp. Surprisingly close is the 18,500/5639m foot top of Kala Pattar, the famous mountain known for its views of the top of Everest and Base Camp. We will climb up with our Sherpas in the afternoon for photos. Day 15  Today we visit Everest Base Camp 17,500ft/5334m. This is the day we get a small taste of what an Everest climber's life is like living at Base Camp and above for many weeks. 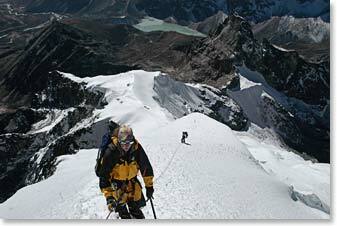 You will feel the challenge as you hike up the glacial moraine towards Base Camp. It will not feel much like the movies when you get there. The challenges of living at altitude will be very tangible. Everest Base Camp is a famous but temporary habitat among the glacial boulders and ice of the upper Khumbu Glacier. The full mass of the Khumbu Icefall will not be viewed until you walk into Base Camp, but the creaks and groans of the glacier and the roar of avalanches from the slopes around will be heard during the entire day's hike. We return to our lodge at Gorak Shep with memories that will last a lifetime. 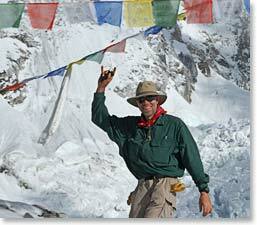 Day 16  Our destination today is beautiful base camp for Lobuche peak. 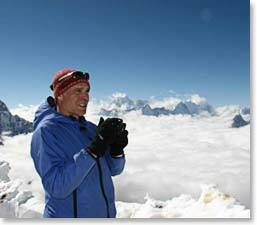 This is one of the most spectacular camping locations in the Khumbu at 15,800ft/4,816m. Day 17  Climb to high camp at about 17,100ft/5212m. Day 18  Summit day. Day 19  Alternate summit day. Day 20  In a long day we return to Ang Temba’s house in Pangboche for showers, a great meal and a good night sleep in a bed. Day 21  Pangboche to Namche. This town always has friends to visit, things to do. We spend another relaxed day here to "take it all in." Day 22  Hike to Phakding. Day 23  Hike to Lukla. At Lukla in the evening we have a party with our Sherpas and staff. Day 24  Flight from Lukla to Kathmandu. Day 25  An alternate day for KTM flight or free day to spend in Kathmandu. Day 26  Depart Kathmandu. Day 27  Return home.